If you haven’t taken a moment to appreciate Thomas Jefferson yet—his birthday is today!—you should. I mean, yes, he did a lot of great things for our country, including giving us the Declaration of Independence, launching the Lewis and Clark Expedition, and making the Louisiana Purchase. But if you’re a fan of mac and cheese, ice cream, or french fries, you should really be grateful: Apparently a great lover of carbs, Jefferson introduced all of these delicious treats to America. Despite a long-standing rumor, Thomas Jefferson did not invent ice cream. Not even close—in one form or another, it’s been around since at least 200 BC, when people ate a milk and rice mixture that had been frozen in the snow. But if you’re American and you love a bowl of mint chocolate chip or a waffle cone stuffed with Rocky Road, you probably do have Jefferson to thank: His obsession with the tasty treat is what made it popular in the United States. It’s believed that Jefferson first encountered ice cream during his stint in France from 1784 to 1789. When he returned home, he brought recipes and an ice cream freezer to ensure he could enjoy the stuff for the rest of his life. 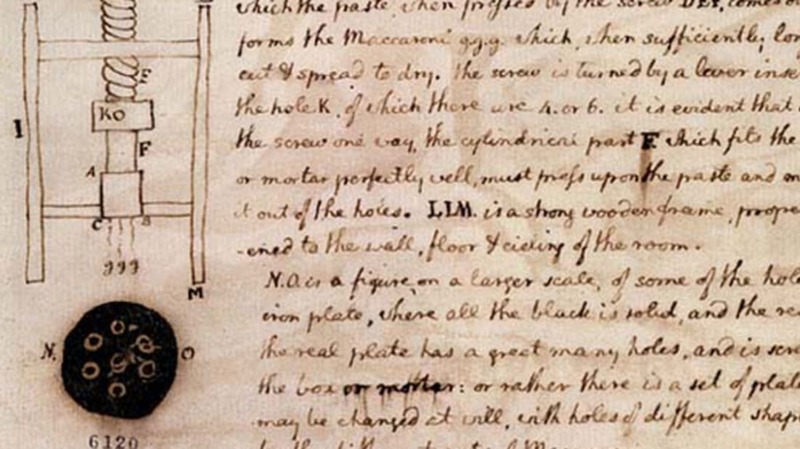 Jefferson’s handwritten ice cream recipe resides at the Library of Congress these days, but you don’t have to go to D.C. to get the details—they’re right here. Thomas Jefferson also brought back a French recipe for “pommes de terre frites à cru en petites tranches (potatoes deep-fried while raw, in small cuttings).” Despite Jefferson’s enthusiasm about the fried spuds, which he cut in rounds, not sticks, they didn’t really take off in popularity until the 1900s. Nevertheless, we can thank him for the idea—his handwritten recipe predates cookbook French fry recipes by half a century. After sampling some of France’s finest champagne, TJ insisted on serving the beverage at most formal dinners he hosted. He was such an avid fan, in fact, that he kept a corkscrew in the same carrying case as his toothbrush. But Jefferson didn’t like the effervescent delight that we do today; he preferred his champagne flat, feeling that sparkling variety was just a silly fad. Somewhat related to Jefferson’s love of macaroni and cheese is his love of Parmesan. Though he wanted to replicate the production process in America, Jefferson ultimately decided it was impossible to recreate the flavors in the cheese since it was made from the milk of Italian cows. Instead, he had many wheels imported for his own personal use—he was especially fond of sprinkling the cheese over the top of his “macaroni pie” to finish it off. Jefferson was also extremely interested in a steam-powered grater, capable of shredding a chunk of Parmesan in minutes. 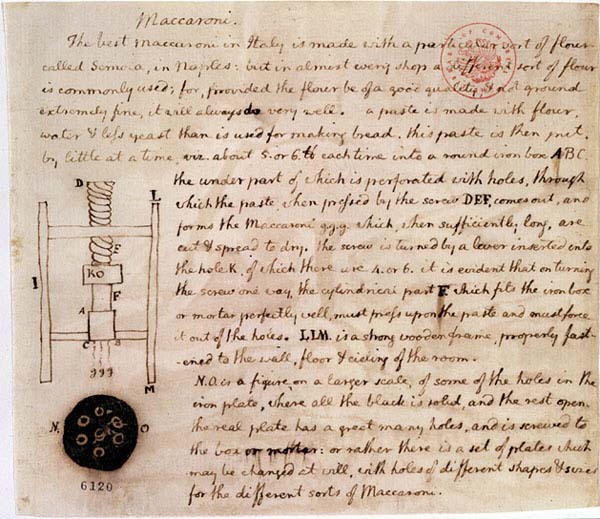 Between that, the macaroni machine, and the ice cream freezer, it’s safe to say Jefferson was probably the first kitchen gadget enthusiast in America.